Cutting-edge research from British universities has confirmed a belief long held by conspiracy theorists, realists and hawkish neoconservatives alike: oil drives foreign intervention and war. Foreign governments are 100 times more likely to intervene in civil wars if the troubled state is home to hydrocarbon reserves, according to a new report by academics from the universities of Warwick, Portsmouth and Essex. Following systemic analysis, the academics found that economic incentives are major drivers of foreign intervention. “Military intervention is expensive and risky. No country joins another country’s civil war without balancing the cost against their own strategic interests,” he added. The report, published in the Journal of Conflict Resolution, examined 69 civil wars between 1945 and 1999. It said civil wars amount to 90 percent of all militarized conflicts since the close of World War II, and almost 67 percent of these have been characterized by foreign intervention. The research frames oil as a dominant motivating factor in conflicts, and argues hydrocarbons heavily influenced the West’s military intervention in Libya. It also suggests oil plays a noteworthy factor in the US-lead war against Islamic State (IS, formerly ISIS/ISIL). Dr. Vincenzo Bove, of the University of Warwick, said IS militants received little attention from Western media outlets until they began to encroach upon the oil-rich Kurdish region of northern Iraq. “But once ISIS got near oil fields, the siege of Kobani in Syria became a headline and the US sent drones to strike ISIS targets,” Bove told the Independent. After carefully modeling the decision-making processes of a series of third-party interventions throughout history, the researchers reached a number of conclusions. Factors which played a part in influencing a foreign government’s decision to intervene included the military might and strength of insurgents on the ground, and the extent to which they sought to control valuable resources such as oil. The report found that foreign governments’ decision to intervene was largely dominated by their desire to control oil supplies in conflict-ridden states, while historical, geographic and cultural/ethnic ties were far less important. The researchers noted that America maintains a military presence in Gulf states that produce oil, and has a long history of backing despotic regimes despite the US administration’s supposed agenda of democratization. But they argued a recent rise in US oil production indicates the state will intervene less in the near future. Additionally, they suggest the world can expect a cycle of low intervention in years to come because plunging oil prices make it a less valuable resource to protect. The report’s authors also said China may assume a leading role in foreign intervention in future years. Britain has a long history of foreign intervention. If viewed through a lens of economic incentives, a stark pattern begins to emerge, according to the report’s authors. Britain intervened in Nigeria’s civil war between 1967 and 1970. Because the British government was heavily dependent on oil located in the eastern Nigeria, stability in the region was critical. 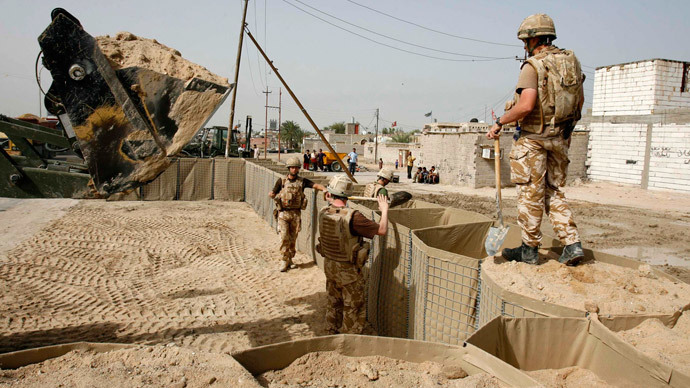 Likewise, Britain invaded oil-rich Iraq in 2003. Political analysts across the globe maintain the US-UK invasion was in part motivated by a desire to control the region’s oil reserves. Finally, in 2011 Britain partook in a Western coalition that intervened in Muammar Gaddafi’s Libya in 2011 – another state noted for its plentiful hydrocarbon reserves. By contrast, Britain failed to intervene in Sierra Leone's 11-year civil war (1991-2002), which ravaged the nation and left over 50,000 dead. The British government also failed to intervene in war-torn Syria, after President Bashar Assad was alleged to have launched a chemical attack against his people in 2013. Much like Sierra Leone, Syria is not a big oil producer. Experts suggest the most significant motivations for wars are generally the least discussed, while peripheral or false motivations are often circulated with gusto. Traditionally, war and foreign intervention are thought to be driven by a complex cocktail of factors. Such factors are widely accepted to be propelled by governments’ pursuits of strategic interests, which generally benefit elite members of their societies. The desire to control valuable resources, the desire to dominate key geographic territories, the strengthening of a lucrative military industrial complex, the desire to intimidate enemy states and the extension of financial deregulation across the globe are often cited as key factors.